This simple and deeply evocative oil painting from the artist’s ‘Lonely’ series shows the direction of the new generation of Burmese painters. 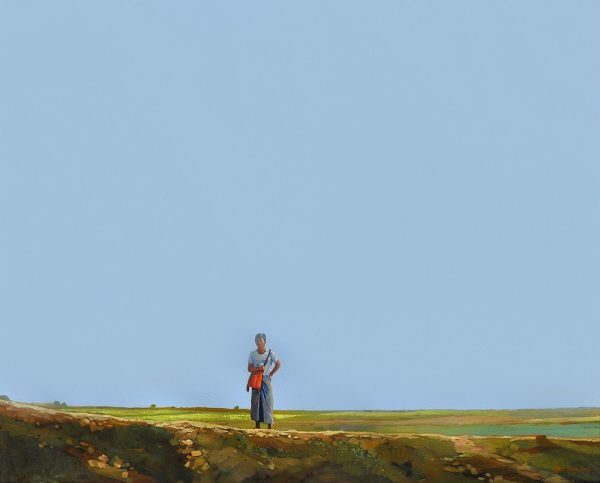 Its brilliant composition and boldness in its depiction of a man in traditional Burmese dress including the ubiquitous longyi and with a Shan bag hung over his left shoulder standing alone on a barren flat against a wide blue sky allows the artist Thike Htoon Zaw to deliver a strong and instant narrative, marking him out as one of Burma’s most interesting young artists. Thike Htoon Zaw was born in 1987 in Minn Hla, Burma (Myanmar). He studied under the artists U Aye Myint, U Aung Thin Oo, U Myint Oo, U Moe Nyo and U Zayar Aye. He graduated from the Fine Arts School, Rangoon (Yangon) in 2006.